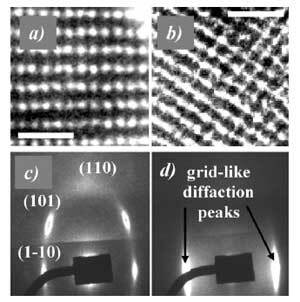 (Nanowerk News) A novel instrument for analyzing porous nanostructures will aid the improvement of photocatalysis, which is an important application in industry, for example for water or air purification. Titanium Dioxide, or Titania, (TiO2) appears to be the best material for photocatalysis applications. The photocatalytic activity of TiO2 depends among other things on the surface area of the catalyst and high photocatalytic activity is associated with high crystallinity and high surface area. Porous materials have an enhanced surface area compared to smooth ones and therefore would be better suited for photocatalytic processes. However, general synthetic techniques do not produce porous particles and researchers are looking to develop specific methods to synthesize porous materials. Researchers at the Université Pierre et Marie Curie in Paris have developed a novel instrument for analyzing porous nanostructures with which they describe just such a method. Their work is described in an article titled "Optimized photocatalytic activity of grid-like mesoporous TiO2 films: effect of crystallinity, pore size distribution, and pore accessibility" in issue 10 (2006) of Journal of Materials Chemistry. Clément Sanchez, director of the Chemical and Condensed Matter Laboratory (LCMCP : Laboratoire de Chimie de la Matière Condensée de Paris) at the Université Pierre et Marie Curie explained to Nanowerk: "We developed a novel ellipsometric porosimetry technique: Environmental Ellipsometric Porosimetry (EEP). This allowed us to investigate the porosity and pore size distribution of the crystalline TiO2 thin films that we fabricated in our lab." Sanchez and his colleagues Cédric Boissière and David Grosso developed the EEP in collaboration with Dorian Zahorsky from SOPRA. Yoshiaki Sakatani contributed with the photocatalysis experiments. Sanchez' group has recently worked on mesostructured (structures mostly consist of long range ordered pores with amorphous pore walls) thin films. They showed that the preparation of highly ordered and porous anatase coatings requires perfect tuning between the chemicals, the deposition process and the treatment critical parameters. Until their most recent work, no precise investigation concerning the effect of the pore size combined with nanocrystallite dimension on photocatalytic activity has ever been reported. LCMCP's EEP analysis is rapid and cheap and operates at ambient pressure and temperature. Ellipsometric porosimetry is based on the adsorption of a liquid from a saturated-gas phase. The adsorbate volume as function of pressure is monitored by recording the change of the optical properties of the film using ellipsometry. LCMCP's EEP analysis was performed with water and produced a set of water adsorption-desorption isotherms. A modified Kelvin equation, coupled with a modelisation of pores contraction, enabled the determination of the structural parameters of films porous networks: ellipsoidal pore diameters, porous volume, and surface area. Sanchez says their present work shows, through the very powerful EEP technique, that mesostructured TiO2 based films open their porosity to accessibility upon thermal induced diffusive sintering. It also permits the accurate definition of the pore size distribution and the interconnection between them. In the present case, it revealed that the mesoporosity is still ordered and well defined up to 600°C. "According to our photocatalytic measurements" says Sanchez "we confirm that the activity is more efficient when the porosity is high and completely accessible to adsorbate species and when nanoparticles and pores have dimensions of 7.5 and 5.5 nm respectively."